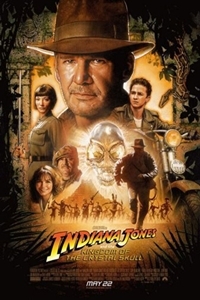 After being forced to leave Marshall College under dubious circumstances, Indy joins forces with rebellious, young Mutt, who believes he knows the whereabouts of one of the most spectacular archeological finds in history--the Crystal Skull of Akator, a legendary object of fascination, superstition and fear. But, as Indy and Mutt set out for the most remote corners of Peru--a land of ancient tombs, forgotten explorers and a rumored city of gold--they quickly realize they are not alone in their search. Soviet agents are also hot on the trail of the Crystal Skull. Chief among them is icy cold, devastatingly beautiful Irina Spalko, whose elite military unit is scouring the globe for the eerie Crystal Skull, which they believe can help the Soviets dominate the world--if they can unlock its secrets. Indy and Mutt must find a way to evade the ruthless Soviets, follow an impenetrable trail of mystery, grapple with enemies and friends of questionable motives, and, above all, stop the powerful Crystal Skull from falling into the deadliest of hands.